On its surface, Wonder is about feeling like an outsider. Auggie Pullman (Jacob Tremblay, proving that his remarkable turn in Room was no fluke) is about to start middle school. There’s anxiety enough in that, but this will be Auggie’s first “real school,” having spent his formative education being homeschooled by his more than capable mother (Julia Roberts). But there’s more. Auggie suffers from a congenital malady which, after dozens of surgeries, leaves him with an unusually misshapen and scarred face. This is why he prefers to wear a space helmet whenever he’s in public. To its enormous credit, Wonder makes Auggie’s plight universal. Doesn’t everyone entering middle school desperately fear some kind of ostracism? Doesn’t every parent fear the same for their tender youngster? Roberts, whose work in recent years has radically outshone everything from the first couple decades of her career, offers a strong and believable center of gravity for both the Pullman family and the film. Director Stephen Chbosky also co-wrote this adaptation of R.J. Palacio’s popular juvenile fiction book. Chbosky waded into similarly angst-ridden waters when he directed the screen version of his own novel Perks of Being a Wallflower, but with Wonder he manages to find an emotional truthfulness missing from his previous film. Wonder is surprisingly—almost amazingly—understated, given the content. The film avoids many a tear-jerking cliché and sidesteps sentimentality more often than you might expect. It’s also dishonest— well-meaning, but wildly dishonest. Conflicts are easily resolved, lessons quietly learned, comeuppance generally had and loose ends carefully tied. 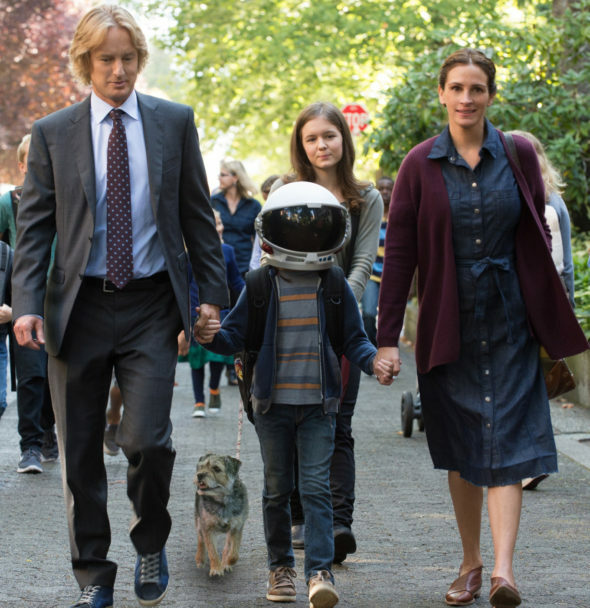 Wonder is about as wholesome a movie as you will see, lacking even an ounce of cynicism, which certainly makes Auggie’s ordeal easier to bear. But it’s still a cinematic cop out.